Matt MacDonald, left, and Jake Shapiro record an interview in PRX's Podcast Garage. Should public media’s role on the Internet be to make content for commercial platforms? Or should public media try to be the platform? 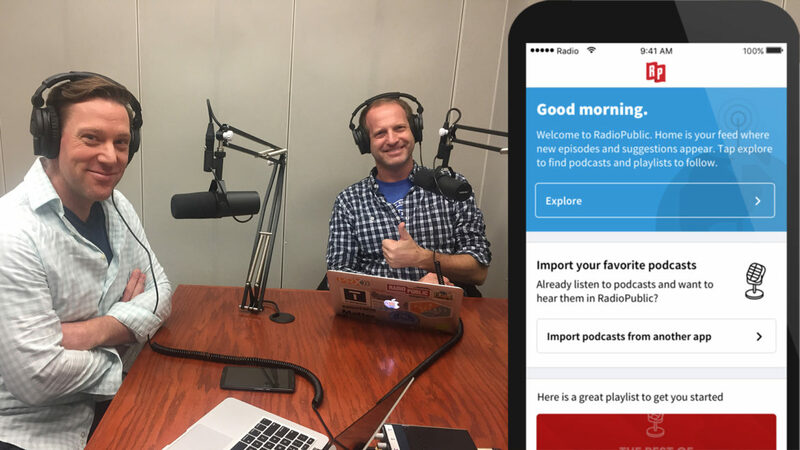 The new RadioPublic mobile app is attempting to do the latter. Well, now that platform is here. This week — as The Pub returns from hiatus — we take RadioPublic for a test drive with Shapiro and Matt MacDonald, RP’s chief product officer, and we talk about why they felt they had to leave the nonprofit world in order to create it. Also this week, I use the very silly new podcast my friend and I made about Billy Joel to make a vaguely serious point about how and when to insert clips into talk shows. “Suspect Convictions” has been downloaded more than 600,000 times since its launch this month. This app might be a good idea if it can promote good podcast shows that few people know about. Perhaps the best way to find good shows would be to eliminate the podcasts in the directory that stopped producing new shows? The best part of the technology behind podcasting is that you will never miss a show you like as long as you are subscribed. Some of my favorite shows are only put out once every few months, and it’s always nice to see a show show pop up in the feed. One thing I love about the radio is that you can scan through the stations and at some point land on something local. I’m wondering if Radio Public will build in a way to serendipitously encounter local content.